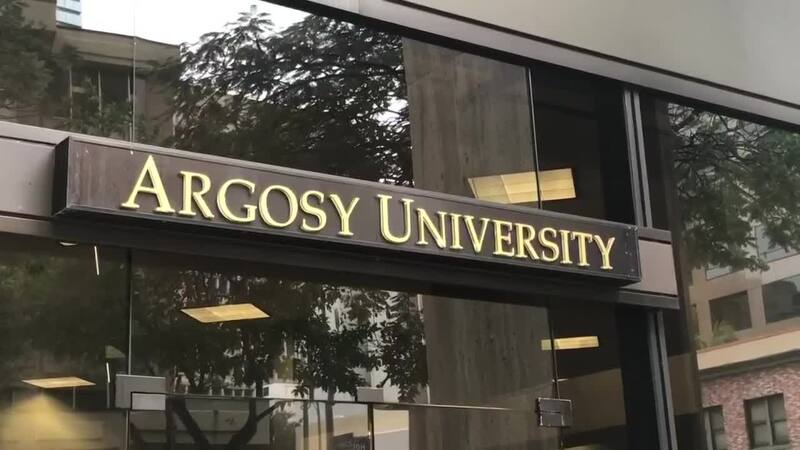 HONOLULU (HawaiiNewsNow) – Argosy University ceased operations at campuses across the state Friday, abandoning hundreds of Hawaii students mid-semester. And students aren’t the only ones who will see the fallout. Experts say Argosy’s closure could leave the state struggling without enough licensed psychologists given their unique ― and popular clinical psychology doctoral program. Argosy has campuses nationwide, including one in Downtown Honolulu and classes on several Neighbor Islands. In all, it has about 800 Hawaii students. On Friday, U.S. Sen. Brian Schatz and other members of Congress urged the U.S. Department of Education to offer support to students left in the lurch as Argosy University ceases operations Friday. The senators said the U.S. Education Department should offer students borrower defense, semester debt cancellation, assistance with transferring to other schools and other help. Earlier this year, Argosy University’s parent company filed for receivership in federal court. The U.S. Department of Education subsequently made the rare decision to kick the university out of the federal financial aid program. In making the decision, federal officials pointed to months of alleged financial mismanagement, including a failure to pay out over $16 million in financial aid to students. In a statement, the receiver for Argosy’s parent company said that officials have been looking for solutions. “If the campus is not acquired by another higher education institution, or another institution does not agree to teach out the programs, upon court approval, it will close on Friday,” said receiver Mark Dottore. As students scramble to look for other options, many are also worried about how the closure will affect Hawaii’s mental health system. According to Argosy University’s Hawaii website, it has graduated more than 260 doctoral level clinical psychologists in the last 10 years. Those psychologists work in facilities across the state, which has a shortage of mental health professionals. “Because of the closure of the Hawaii school of professional psychology, there is a high likelihood, unless something is done immediately … children, teenagers, people are going to die” because they can’t get care, Knightsbridge said. Graduate student Natalie Ries said she and her classmates are also in dire straits. Many graduate students are hundreds of thousands of dollars in debt and say they can’t pay their rent anymore.